Adobe believes its future lies in digital distribution and subscriptions – and it’s about to bet the company on this. As Adobe announced at its Max conference in Los Angeles today, it’s about to put all of its resources into developing its tools for Creative Cloud. Adobe introduced Creative Cloud, its subscription service for getting all of its tools for designers, photographers, videographers, web developers and audio professionals, just over a year ago. Going forward, Scott Morris, the head of Adobe’s Creative cloud and creative suite team told me last week, this will be the only way to get access to its tools. The company will continue to sell CS6 for the time being, but it’s not clear for how long. 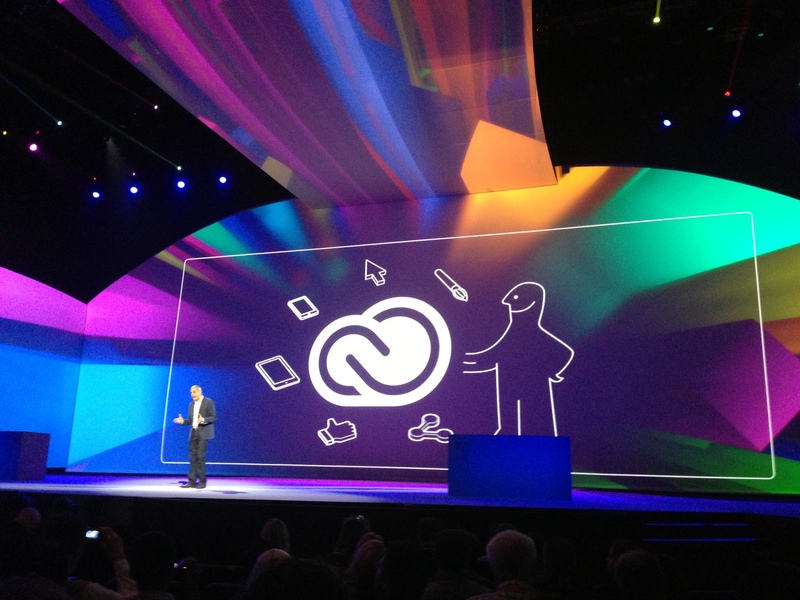 The New Creative Cloud apps will be available June 17. Since it introduced the service last year, Adobe added more than half a million paying Creative Cloud subscribers and two million users who subscribe to its free services. As Adobe’s David Wadhwani noted in today’s keynote, there is no doubt in his mind that Creative Suite is the right direction for the company. As Scott Morris told me, the company was surprised by the success of Creative Cloud and decided that instead of trying to keep working different versions of apps like Photoshop, Dreamweaver and PremierePro – one for Creative Cloud, which gets continuous upgrades, and one for the next version of the Creative Suite – it made more sense to just focus on using the Creative Cloud as a distribution mechanism for its tools. Producing these different versions was a distraction, and this move, Morris told me, will “give Adobe the ability to focus” and make life easier for its engineers. This change, he believes, will allow the company to be more innovative and deliver new features to its customers faster than before. The company has no plans to release any new versions of Creative Suite going forward, but Adobe will ensure that every CS6 application will run on the next version of OS X and Windows. It will also provide the usual bug fixes and security patches, but it won’t add any new features to the tools. This is obviously a bit of a risky step for Adobe, something Morris acknowledged in our discussion. Most users, he noted, probably expected Adobe to make an announcement like this in the coming years – the fact that it’s coming today, however, will likely be a bit of a shock. What makes him and the rest of the Adobe team believe that this will work, he told me, is that virtually everybody who has subscribed to Creative Cloud loves it. It even gets a higher rating in Adobe’s online store than Photoshop, “which is virtually unheard of,” as Morris told me. Morris also acknowledged that there will be customers who just can’t switch to Creative Cloud and for the most part, that’s because of the online components like the Behance community and cloud storage features. Government agencies, for example, will not want to use this (or aren’t allowed to), schools won’t want their students to publish their work publicly to Behance and some enterprise customers, too, will not want to deal with these features. For them, Adobe has created special licenses and version of the Creative Cloud that still use the online distribution mechanism, but that won’t include that features that these customers will object to. To make the transition easier for current users, Adobe will allow everybody who currently owns a license to CS3 and up to subscribe to Creative Cloud for $29.95 per month for limited time. It will also offer similar price reductions to users who just bought stand-alone products like Photoshop.